Day 21. 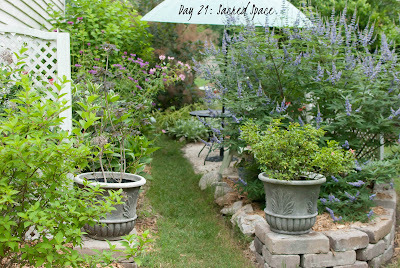 Sacred Space: Share a photo of your special place in your home/garden for your baby/ies/child/ren. This is Lily's memorial garden, which is on the side of my house. It is such a cozy and beautiful space, with a pathway and seating area. I enjoy sitting there with a cup of hot tea, left alone with a book and my thoughts. I enjoy talking about Lily with my mom or a friend and thinking about her there. My mom is an amazing gardener and created this special place for her beloved granddaughter. I tell her the things I want and ideas I have. I love adding accessories to her garden, such as stones and butterflies. There is a bleeding heart plant that was given to me at Lily's Celebration of LIFE Service. It blooms every year. This photo shows just a little peek into the garden. It is impossible to capture how beautiful it is with just one image. The other sacred space is Lily's cedar chest. I have things of hers and things that remind me of her scattered throughout my room and home.